2017 is the year of the affordable 4K Smart TV. With plenty of cutting-edge television models from the likes of Hisense, LG, Panasonic, Samsung, and Sony on the market, it is more possible than ever to enjoy the gameplay experiences of online casinos directly on your big TV screen. This article discusses how to access your preferred online casino website via your 4K Smart television’s in-built Web browsers and other easy methods. Can I play online casino games on my 4K Smart TV? Modern day smart television sets are essentially mini computers in their own right. Most television set models released by the top tech companies for the last five years have incorporated several multimedia features once limited to other traditional platforms, such as apps, Web browsers, paid streaming services (Netflix), firmware updates and more – hence the ‘Smart TV’ marketing term. With Smart TVs able to connect to the Internet via wired Ethernet cable or a standard Wi-Fi signal, you can browse any website like you normally would on your computer, laptop, mobile smartphone or tablet. Because of the inclusion of in-built Web browsers in our 1080p Full HD and 2160p Ultra HD (4K) televisions, it is entirely possible to play our favourite online casino games on our 60 inch plus big screens, from the comfort of our lounge room couches or even the bed if you’re feeling nice and lazy. Why should I play at online casinos on the big screen TV? The answer is dependent on the type of real money player you are and whether you appreciate the very novel but awesome niche function Smart TVs provides – the opportunity to enjoy your favourite online casino gaming experiences with the best picture quality and biggest screen space possible. If you own a 4K UHD television set (or even better, a 4K HDR-enabled UHD OLED TV), chances are you are already fully aware of the massive visual benefits these state-of-the-art TVs bring to the living room in terms of image quality and graphical eye-candy. Colours, detail, textures, everything looks spectacular on a 4K Smart TV capable of displaying images and videos at full 2160p resolution, and even pieces of media not entirely optimised for 4K output still upscale extremely well on the big screen. This includes online casino games. In particular, live dealer casino games, which involves real people in front of a live camera in a specialised studio acting as croupiers for baccarat, blackjack, casino hold’em, keno, lottery, and roulette. They handle the cards, the equipment and betting calls for players, who watch them via a live-stream video in real-time full HD and bet via a digital interface. 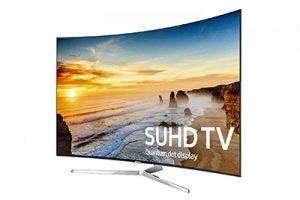 How do I start playing casino games on my 4K Smart TV? Load up your television’s in-built Web browser via the provided television remote and visit our site, www.OnlineCasinoWebsites.com as you are now. Browse through our casino review section to find an digital gambling venue you prefer most, click through our links on your TV and sign-up as you would if you were on computer or mobile. We recommend, however, signing up first via your computer or mobile device just for a quicker process to jump into the game on your big screen. Once you have sorted your deposits for betting money (you can also play for free, so don’t fret if you just want to test things out first), confirmed your details with the casino and logged in, you can move onto loading up the games directly on your TV. Despit technology coming a long way, it is hard to admit the in-built Web browsers in our 4K Smart TV sets are perfect. Depending on the model or your Internet connection speed, it might be too slow to load certain games, or too hard to navigate the games and place bets via your TV’s remote control. Most of these issues are continuously being ironed out as television manufacturers develop their products to house higher-quality multimedia functions. After all, a lot of these features are considered luxuries for television owners, and Internet browsing is still largely seen as an activity best done on computer, laptop or mobile. For now it may not be enough for certain players, and that is completely understandable – thankfully, you can still enjoy your favourite casino games on the big screen via another very easy method. Simply grab an HDMI cable (which are very inexpensive and often already in use with other devices elsewhere in your home theatre setup) and connect it to your laptop or desktop computer. Navigate your television’s input sources to the relevant HDMI input and it will now show your computer or laptop’s screen on your big screen. You can now play your favourite casino games, such as the slots or roulette with your mouse and keyboard like you normally would on the desk or couch, and see all the action in glorious full HD and ultra HD quality on your big screen 4K Smart TV.